You know those little jars of sun dried tomatoes packed in delicious herb infused olive oil that cost about $5 a pop? This (not) Sun Dried Tomato Sauce is just like those yummy tomatoes. …Except not. Ha! This was completely a happy accident and now my life will never be the same. 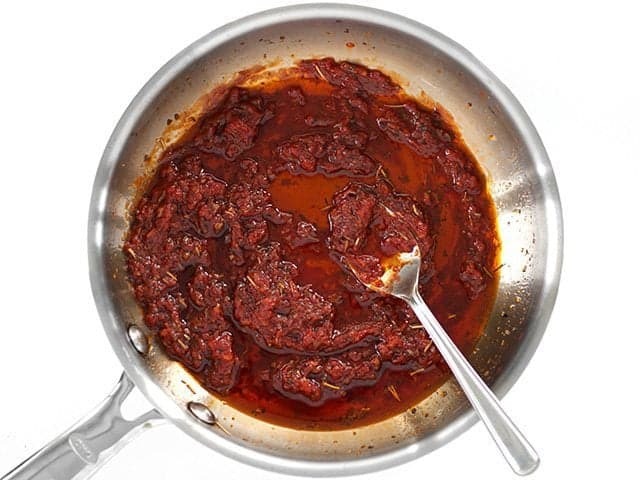 I started out wanting to make something similar to this magic sauce, but was going to use it as a base for my homemade pizza tonight, so I added some tomato paste to make it more, well, pizza-like. When I gave it a taste I was absolutely stunned. it tasted just like those oil packed sun dried tomatoes! I was so happy because nearly every time I’m at the store I want to buy those expensive little tomatoes, but the price always holds me back. Now I know I can make something that tastes really, really similar and for VERY little money. So, what do you do with this “sauce”? Well…. Just go ahead and dip really good, crusty bread in it! It’s so good that I’m sure you can come up with a million more yummy things to do with it! 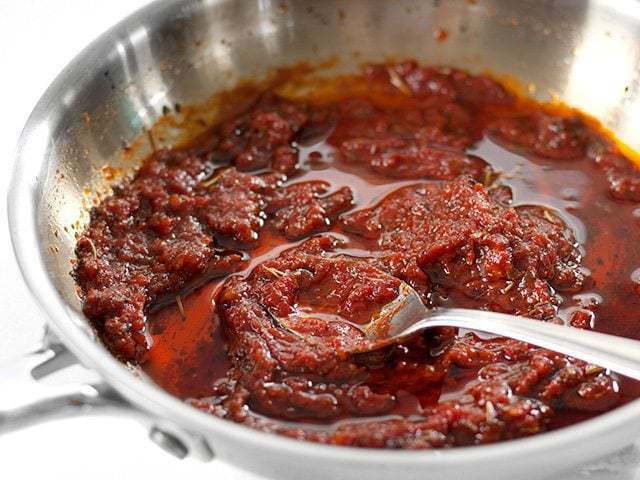 A quick and easy tomato sauce that tastes like it's made with expensive sun dried tomatoes, but it's not! Add the olive oil, garlic, basil, oregano, thyme, rosemary, crushed red pepper, salt, and some freshly cracked pepper to a small skillet. Stir and heat the mixture over low heat for about 3 minutes. It’s okay if it sizzles slightly, but you don’t want it to get hot enough that the herbs burn. Add the tomato paste and honey. Allow it to heat through as you stir. It will not form a smooth sauce. Continue to stir and heat over low for about 5 minutes or until you notice the tomato paste has darkened slightly. Either use immediately or refrigerate until ready to use! 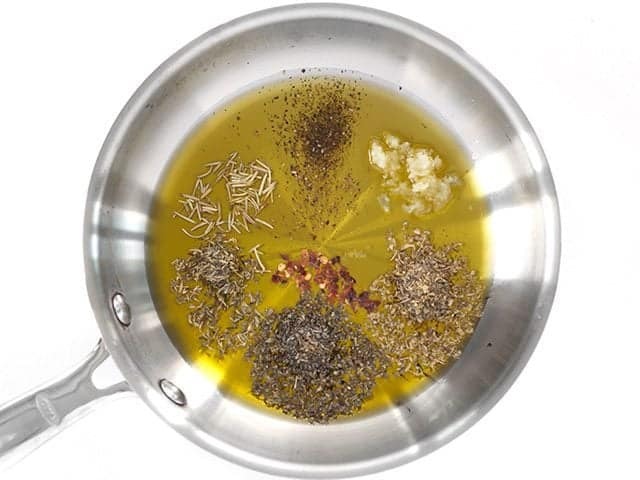 Start by adding 1/3 cup olive oil, 1 clove minced garlic, 1/2 tsp dried oregano, 1/2 tsp dried basil, 1/4 tsp dried thyme, 1/4 tsp dried rosemary, a pinch of red pepper flakes, a generous dose of freshly cracked pepper (10-15 cranks of a pepper mill), and 1/2 tsp salt. Heat over low for a few minutes. It’s okay if the oil sizzles just slightly, but don’t let it burn. 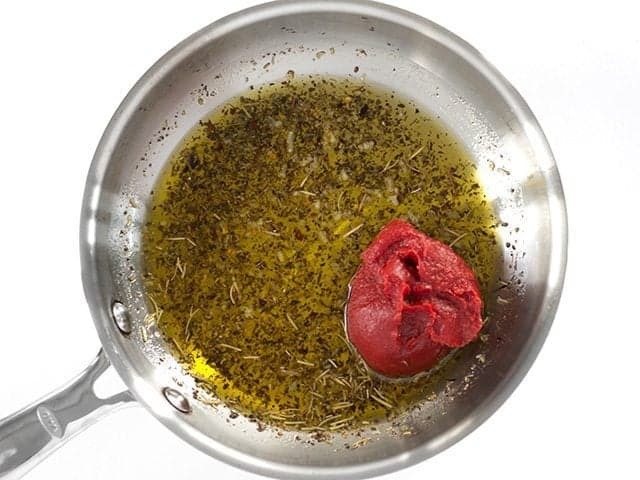 Cooking it for a few minutes helps infuse the oil with the herbal flavor and cooks out the raw garlic flavor. Next add 3oz. (half of a 6oz. can or about 1/3 cup) tomato paste and 1/2 tsp honey. Don’t forget to freeze the rest of your tomato paste so that you have it on hand the next time you need some! Cook and stir over low heat until it’s heated through and the tomato paste has darkened slightly (see the difference between the vibrant red in the last picture and this deep crimson color?). That should take about 5 minutes. Now it’s ready to use! This recipe makes about a half cup of (not) Sun Dried Tomato Sauce. The “sauce” will not be a smooth, cohesive mixture because of the oil/water thing happening. But, that doesn’t mean it’s not delicious! Can you almost TASTE it?! Wow! I’m impressed. I came across yet another recipe that called for the sun-dried tomatoes that I never have on hand so finally it occurred ro me to google “sub for sun-dried tomatoes” and this recipe came up! Lovely sun-dried tomato flavor for pennies. This solves a problem I’ve been puzzling about for YEARS! Thanks a million! Absolutely amazing!!! Cannot tell you how many times my husband and I have made this. We usually add artichoke hearts and spinach and toss in bowtie pasta. Yum! My VERY picky 5 year old ate this last night on pasta. It was the first time in a long time my entire family ate the same thing for dinner. I call that a winner! What a delicious, easy sauce. Oh. My. GOODNESS. I will never buy canned pizza sauce again. This is so much cheaper and infinitely more flavorful. I discovered this recipe 3 years ago and just wanted to tell you that I still come back to it every couple of weeks! It’s amazing in pasta, on pizza, with bread…*ahem*…on a spoon by itself…Anyway, I adore your website, the way you think, and the flavors you always manage to come up with on a budget! I’ve tried this recipe with tomato paste, with great results (as always)! However I’m more likely to have ketchup rather than tomato paste on hand. Have you ever tried ketchup with any luck? Ketchup has quite a bit of sugar and isn’t as concentrated as tomato paste, so I think it wouldn’t be quite as potent. I was so surprised about how dang delicious this turned out. I tossed it all with a box of cavatappi and we were in chewy pasta heaven. We couldn’t stop eating it. My only tweak was to add in a tsp of sugar. Thanks! I don’t like to use a lot of oil what measurements would you reccomend if I used less oil and more tomatoe paste or something else? You could probably reduce it to 1/4 cup oil, but I wouldn’t lower it any more than that. You don’t need to replace it with anything, either. I made a double recipe with 2T oil and it was very good. Next time I will cut it back to one tablespoon. Nice smooth paste! Way too salty. Even my boyfriend who loves a lot of salt thought so. 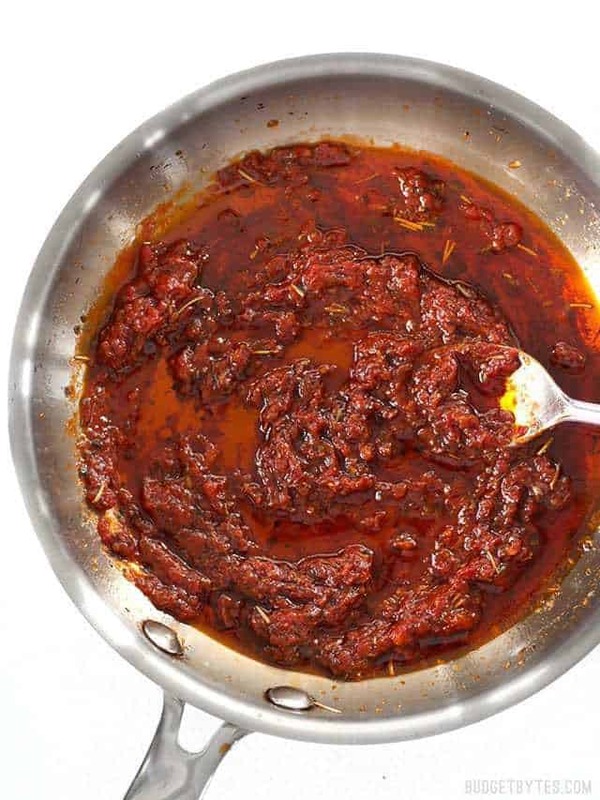 BUT other than that, a neat trick of making inexpensive imitation sundried tomato sauce! Next time I’ll just cut the salt in half. Wow! So simple yet it was uber tasty and full of flavour. Thanks! !